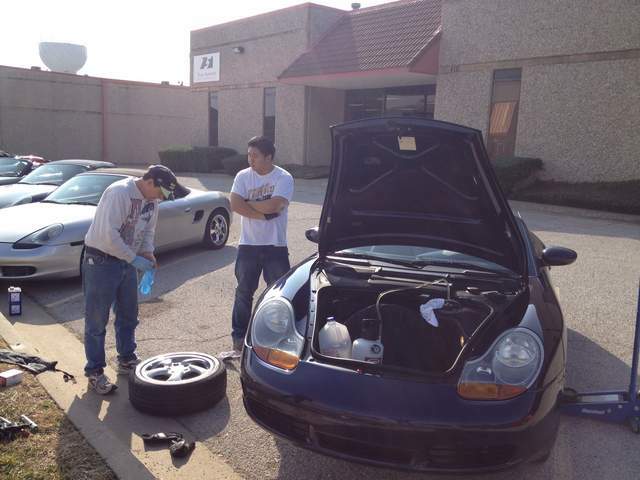 North Texas Boxster Enthusiasts Meet Again! Well, if you were not at our last meeting of MTBE…you MISSED ALOT of FUN! Our meeting co-sponsor, John (Che) of Top Speed Pro 1 Performance really went ALL OUT for us! We met at his shop on Billy Mitchell in Addison and he hosted the best event yet! His staff and son were there to give us a tour of his facilities, including a NEW DYNO, HUGE warehouse FULL of Porsche parts AND FREE drinks! We also walked away with FREE Top Speed baseball caps and license plate frames….all courtesy of John and his team at Top Speed!!! They were great! He is a really nice man too! And that is NOT just a shameless plug either, and No I have not been bought out, just really recommend his level support for our cars! Thanks John! Our meeting had more "work" actually getting done this time too. 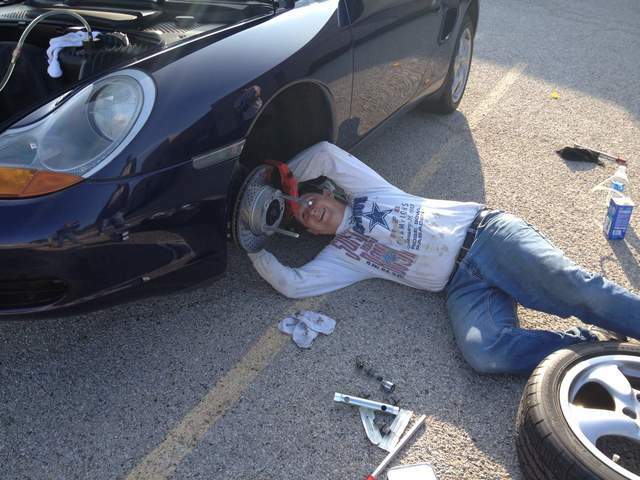 We did brake flushes and "the suspension injection of life" into our cars! So they are riding and stopping much better now! The best part is…our members DID NOT have to pay anything to get it done! 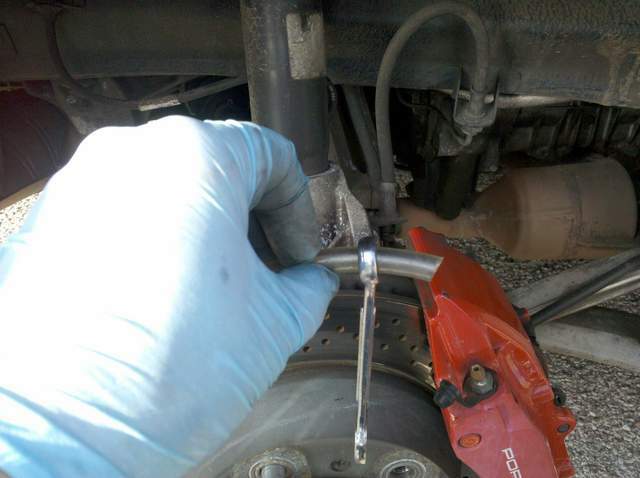 Our members provided the Motive Brake Bleeders and skill to get it done! The best part is….John gave us GREAT DEALS on Top Speed's Cat Back Exhaust system AND Short Shift Kits…and that's not all! John has stepped up to offer us discounts on VIRTUALLY EVERYTHING THEY CARRY!!! Makes you want to be in the NTBE now, huh? 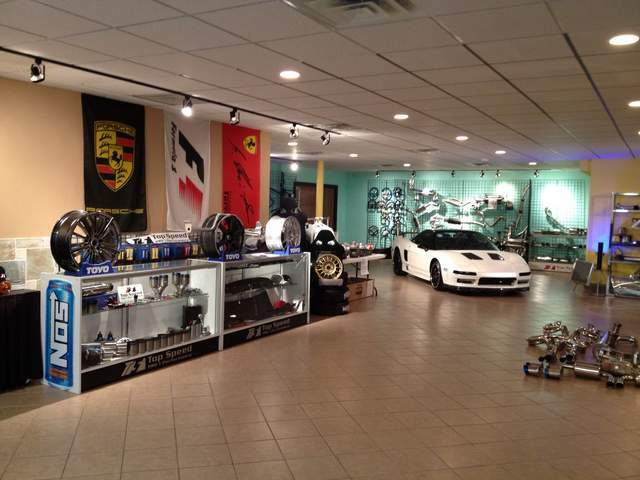 Top Speed has a whole warehouse full of GOODIES - such as GT3-type seats ($325 for a pair! ), Cat Bypass pipes, body skirts, body panels (just in case you run into Bambi) you can UPGRADE instead of just 'fixing it'. You can add GT3-type front and rear body panels - so you will almost hope for a deer! We really got our hands dirty this time but TS was there with Agent Orange to clean us up enough to get back in our cars and go home. The event lasted several hours this time too. Thanks for staying late for us John, hope you didn't get in too much trouble at home. The guys can post more pics of the event. Make sure YOU ATTEND next time…we are really able to offer more than just getting together and 'talking' - we are putting our work where our mouth is! Once we get our cars going well…why don't we drive around DFW and show 'em off? O.K. 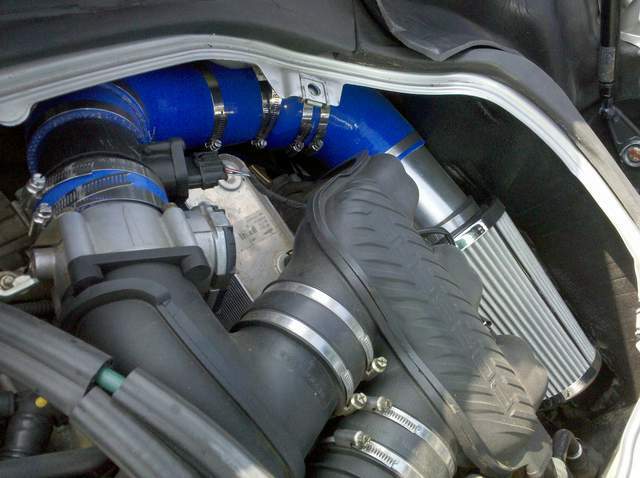 so I had to show off my 4" Air Intake system too. The MAF has adjusted and I am getting reasonable fuel economy with AWESOME ACCELERATION! Here is only ONE REASON you shouldda been there….Top Speed practically GAVE US these Cat Back Systems. I already have mine installed and IT ROCKS!!!! The sound is superb! And for less than 'one leg' of a Fabspeed system! HARD TO BEAT! 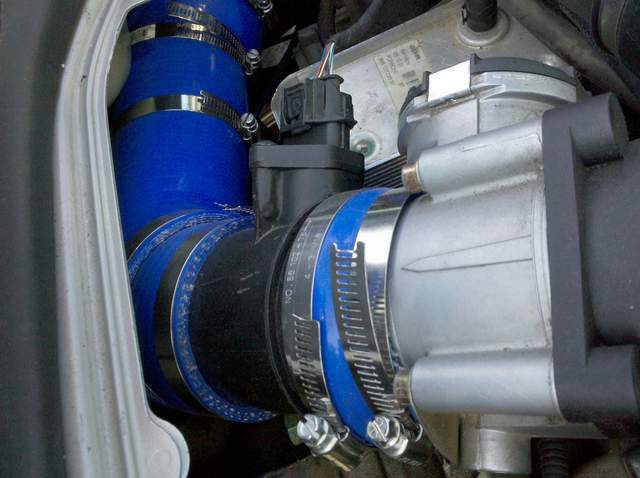 Will post pics and installation instructions, for those of you that bought these TS Cat Back systems at the event and have asked about it, in the Performance Section of the Forum later today. So keep your eyes peeled, and now the road too! You SHOULD HAVE BEEN THERE!! The extra power, weight loss and incredible sound make the cat delete and muffler a no brainer. 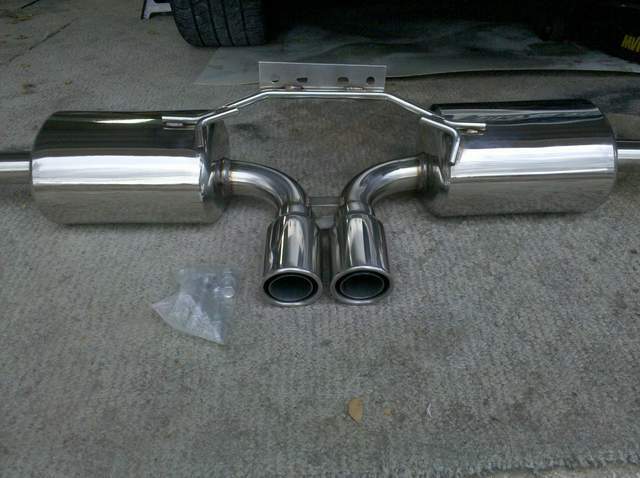 Gas mileage suffers as you're always looking for a chance to hear your exhaust. You're right about John at TS, he's a great guy. 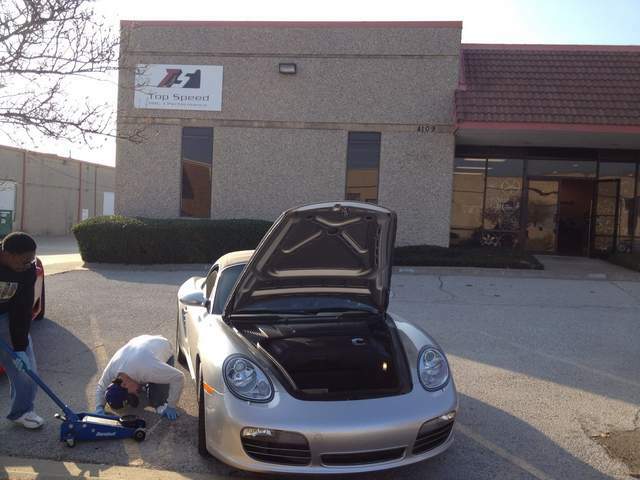 Many thanks to John at TopSpeed! Really a nice, down to earth guy. I also have to thank Kenny and Mark for putting this little group together. Of course we all hope Kenny is back on the road soon! 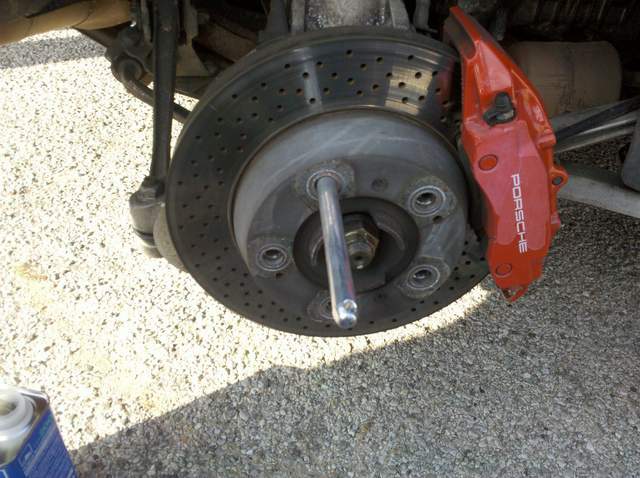 If you haven't flushed your brakes, I recommend that you do. It was obvious from all of the gunk coming out, that it had been awhile since mine had been done. Here are some of my shots from the day. Thanks for the pics Bruce but I am much better looking in person! Also, you can tell who was doing the most work…the guy with the lowest pants! John, I REALLY need to drive up and see you. 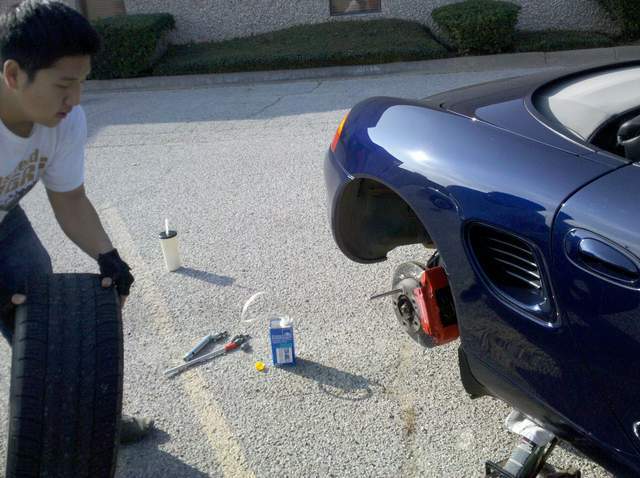 My boxster features all your first parts and they're still rocking! Just installed the short shift kit you sent as a gift, what, six years ago? It made downshifting at the last DE coming off the straight at 110 mph a breeze. p.s. anyone is always welcome to stop by and chat. Time do fly quick, its about 6 years ago when I start posting on this forum lol. We're gonna have to meet at the track next….so we can "test out" all of John's good work and support our local race tracks. Just work where and when and count me in! All this maintenance work it making me itch to drive REALLY FAST! I feel the need to 'Carve up' some turns or 'Clock' the heck out of something! Maybe it's just me, watching all those vids of Mike (DFW02S) go round the track! Mayeb we;ll have a short winter and can get to racing early this year! Eager to join the club and hit some track days. 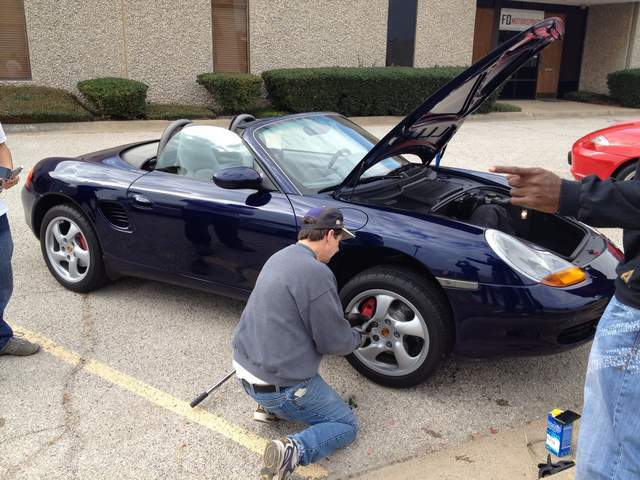 I pickup up a boxster recently and now I'm eager to have fun with it!